Click the button below to pay your water bill and taxes by credit or PayPal. The 1990’s brought changes to the town, once again, but this time, the changes were not so positive. 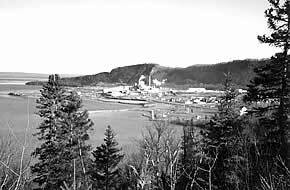 Hard times hit Red Rock, just as they did in the rest of the country, and the fate of the mill and ultimately the Township of Red Rock was in doubt. At the mill, the decision was made to shut down the newsprint operation permanently. The announcement had a devastating effect on the entire community as laid-off employees and their families tried to come to terms with the news. As the reality of the situation at Domtar sunk in, many citizens began to question what the future held in store for them. Would there be a Domtar? Would the town exist? The down-sizing of the workforce at Domtar from 650 to 300 meant that many young people had to leave the community in order to find work. At the school, this reflected in fewer students and around town, more and more For Sale signs began to appear. At Domtar, the newsprint machine was converted to a Kraft machine in order to increase production of liner board to 200 tonnes per day. By 1993, everything was in place to do the test runs of liner board on the newsprint machine and everybody had their fingers crossed. The test runs were reasonably successful and everybody breathed a sigh of relief. A restructuring program was underway to make a good product at a significantly reduced cost. The installation of a secondary treatment was a step in the right direction to meeting the water pollution guidelines that are in place. The system would have benefited not only the mill but also the surrounding communities that would also be tied into the system. Although a feeling of cautious optimism prevails once again in Red Rock, the Township council recognizes the importance of a secondary industry for the area and studies show that industry may well be tourism. It is working in cooperation with other communities along the Northshore to develop a marina system that will encourage boaters to explore all that we have to offer. The Land of Nipigon Trail System links Red Rock and Nipigon with 21 kilometers of scenic nature trails and is another developing attraction to bring people to the area. The Northshore Golf Club is another shared venture between the citizens of Nipigon and Red Rock and work is presently underway to turn it into a championship course. We live in a truly beautiful part of the country and we need to encourage others to enjoy with us. Get the Latest News & Upcoming Events direct to your email. Copyright © 2018 Red Rock Township, All rights reserved.